Will ‘Big Muddy Blues’ be played for the St. Croix, too? 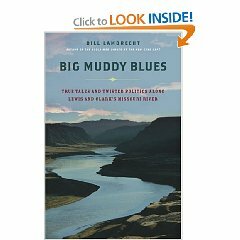 With the St. Croix being designated one of America’s top 10 most endangered rivers this week, folks who enjoy that luscious stream of water that separates some of eastern Minnesota from a chunk of western Wisconsin might want to pick up “Big Muddy Blues” and learn a few lessons. Lessons about how the concerns of any number of people who care about and depend on a waterway can be at the mercy of political ambitions and organizations with clout. Newspaperman Bill Lambrecht in a sense recreated much of the 1802-04 journey of discovery of the famed Lewis and Clark expedition, taking readers along the Missouri from near St. Louis up to the trout fishing haven in Montana where the river forms from three tributaries. Lambrecht shows how the river has changed in the past 200 years — and why. Much of the why falls on the shoulders of the U.S. Army Corps of Engineers and the political maneuvering that led to the building of dams and dikes, of rerouting the Missouri from its natural course to ease barge traffic, of favoring the water needs of the lower river at the expense of native peoples and fishing interests in the Dakotas, among others. Lack of enforcement of federal regulations — an issue that needs to be addressed along the St. Croix today — plays a role as well, but the biggest sin “Big Muddy Blues” points out may be our government’s disregard for scientific findings. Research doesn’t seem to hold much water — pardon the pun — if it means a member of Congress might lose a vote or two. And the empire that the Army Corps of Engineers has built for itself plays right along with the selfish politicians who can’t look past the next election to see how the research they are ignoring affects real people and endangered species, even going to the point of getting researchers transferred to other parts of the country!